Lumbini (Sanskrit for «the lovely») is a Buddhist pilgrimage site located in Rupandehi District, Lumbini Zone of Nepal near the Indian border. It is commonly recognized as the birth place of Gautama Buddha, the founder of Buddhism, who lived between approximately 563 BCE and 483 BCE. 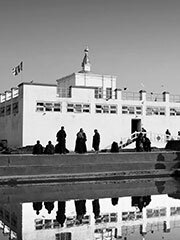 Lumbini is located 25kms east of the municipality of Kapilavastu, the place where the Buddha grew up and lived up to the age of 29. Kapilvastu is the name of place as well as the neighbouring district. In 1896, Nepalese archaeologists (effort by Khadga Samsher Rana ) discovered a great stone pillar at the site, attributed to Emperor Ashoka. Records made by the Chinese pilgrim Fa Xian were also used in the process of identifying this religiously acclaimed site. For Buddhists, this is one of four pilgrimage sites based around the life of Gautama Buddha, the other three being Kushinagar, Bodh Gaya, and Sarnath. Lumbini, as of 1997, is an UNESCO World Heritage Site specifically nominated for the international World heritage program.